As we are not experienced in the art of French motorhoming the use of the ‘aire’ is still a source of total fascination to us. We moved on from what we had lovingly called ‘home’ for the last 7 days, a charged aire, with some trepidation as to what to expect at a free aire in Deauville town. A small car-park, each bay separated by a small hedge, free to park for 24 hours, free electric hookup, free water and chemical disposal facilities. Its amazing, we pay over £20 a night at home for half the benefits – we are officially aire converts. 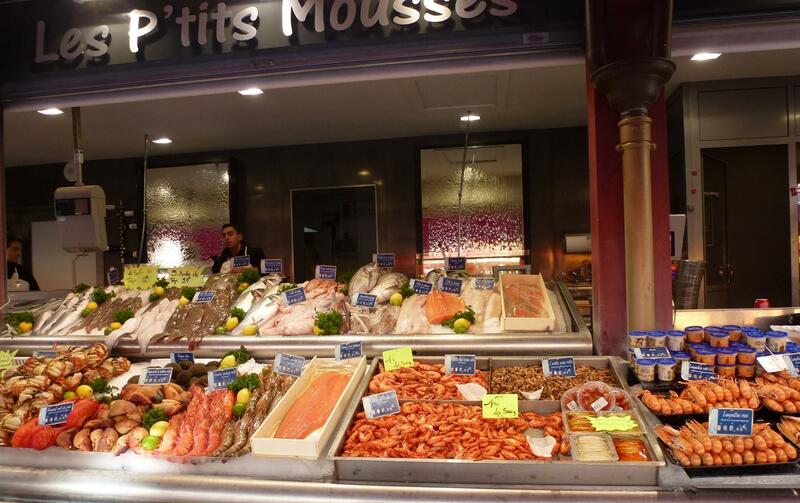 So, Friday, the big day, we dropped the van off late morning at the garage and headed off to Trouville to explore the old town and wander around the fish markets for a few hours. 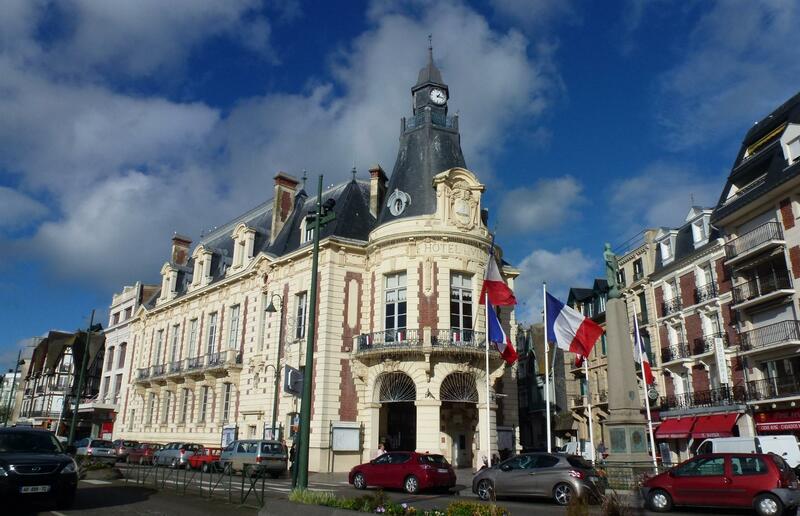 A much older town than Deauville and all the more interesting in terms of galleries, shops and even a couple of portrait painters amongst the cobble streets. Again it was just about warm enough for a stroll along the boardwalk and a picnic at the end of the pier. With 4 hours to kill walked into Deauville to window shop in the incredible over-priced shops that apparently cater to the Parisiennes with weekend holiday homes in the town. We arrived back at 4pm as requested to the receptionist doing the ‘shrug’ and the word we caught was “probleme”. To cut a log and stressful hour short :- the motor ordered was for a Left Hand Drive Fiat, nothing they can do now! I glare meaningfully at mechanic, he gets one wiper working, another mechanic appears, he gets second working – albeit at angles that defy gravity. Iain berates everyone including the AA on the phone, who are now extremely helpful, they agree with garage its their problem and they need to fit correct motor. All agreed for Monday – why last week it took 8 days to get a motor and this week it takes 3 is beyond us but we all agree. With any form of wiper we were getting out of there. Straight off, around “Caen périphérique” at rush hour and in the dark (not be advised) and out to the tiny hamlet of Raids, near Isigny Sur Mer, just over 100km away and far enough to do some new exploring. Our site is Clos Castel, owned by a British couple its like a CL, 6 vans only and it’s just what we wanted. 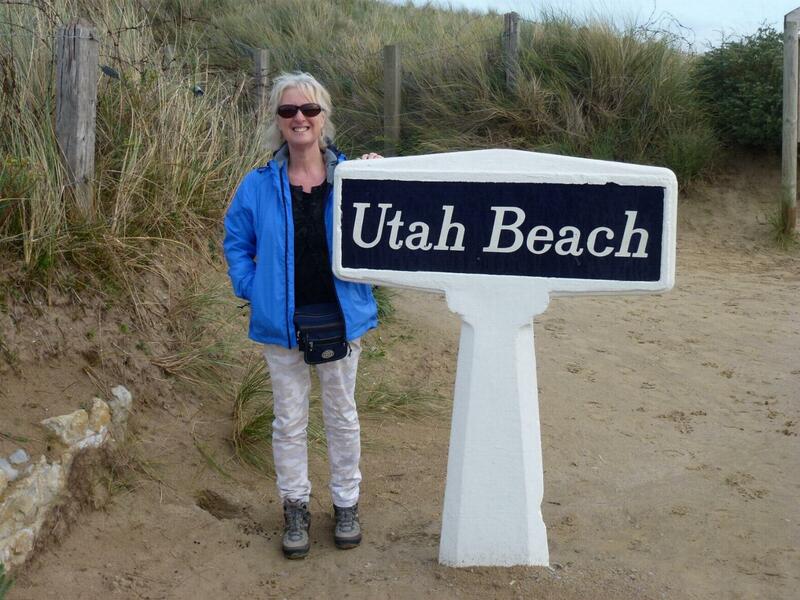 Saturday morning we headed out to Utah Beach, where the first American troops landed on D Day. It’s all a bit surreal, everywhere you go there is a monument to an army division down a lane or on a crossroads, the roads have all been renamed after individual soldiers, each village has a museum (and some are massive museums), in every town and village there are shops selling D Day memorabilia, every cafe and restaurant is named after someone British, American or Canadian, even private homes fly the flags of the allies and have memorials to them in their gardens. Anyway, Utah Beach itself is incredible; beautiful monuments mostly erected by the relevant army or airforce divisions, there is also a fantastic museum which tells the story of D Day in sequence from the planning to the final invasion. On the way back in we stopped off for half an hour at Saint Mere Eglise to see the famous church. This is where paratrooper John Steele’s parachute was caught on the spire of the steeple and he was left hanging there for several hours during the D Day landings. 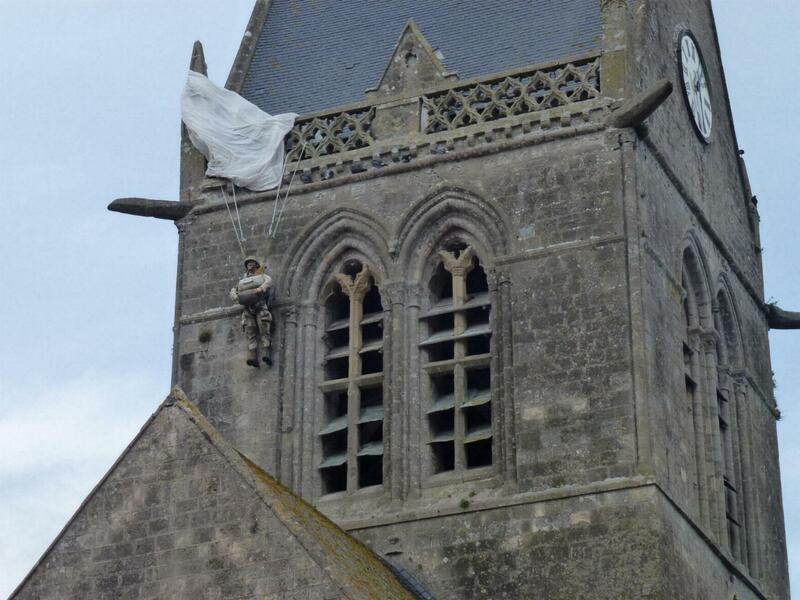 The event was immortalised in the film “The Longest Day”and it is commemorated at the church where a parachute with an effigy of Private Steele in his Airborne uniform hangs from the steeple. 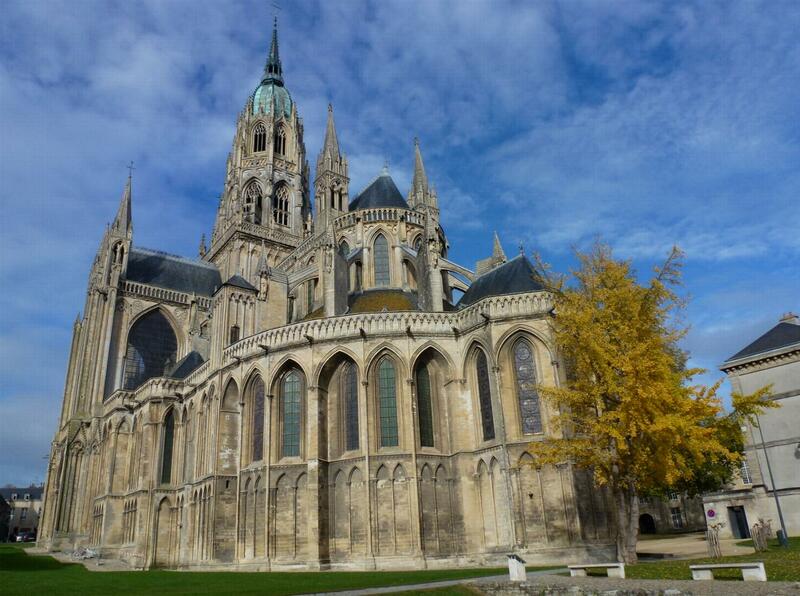 This morning we headed into Bayeux, with a plan to see the tapestry and a quick look around the village. Error number one, it’s not a village its a fair size town, with an incredible Norman cathedral dating from 1077. 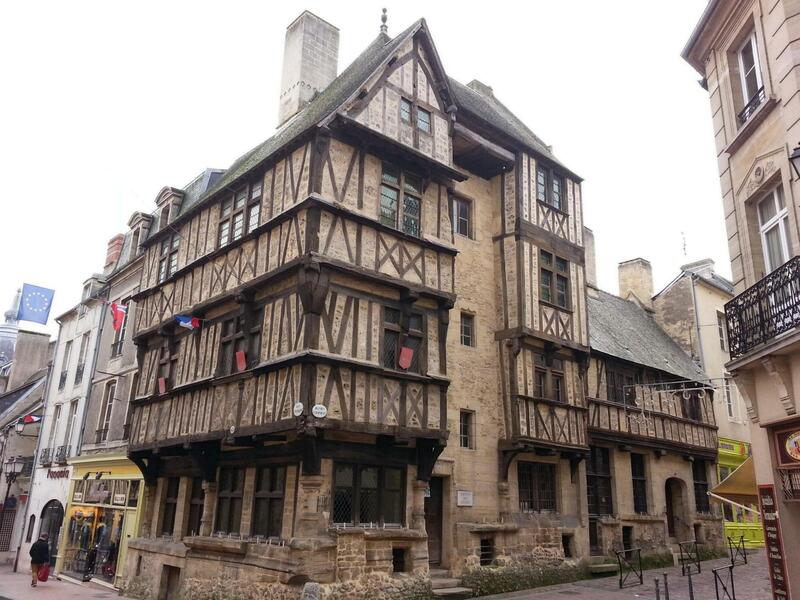 We parked up in the centre of town and had a walk around, quite a few shops open around the gorgeous cobbled streets, but the highlights were the amazing half-timbered buildings (and the aroma from the numerous patisseries!). Having found the tapestry museum we joined the queue and were approached by a French lady who was with a group of touring Porsche owners, she told us to go in with them as they had a discount for a large group – we love moments like that as they remind us of the good in most people. The tapestry was awesome, no other way describe it. That it is 1000 years old does not compute with what you see, yes it looks old but not 1000 years. It really is one of the most amazing things I have ever seen and my only disappointment was they wouldn’t allow photos of it ! First stop was Arromanches where remnants of the Mulberry Harbour are still very much in evidence (the pontoons were built in Conwy before being floated out to Normandy). The photographs don’t do justice to how many of the pontoons are still there and what an enormous harbour it was. 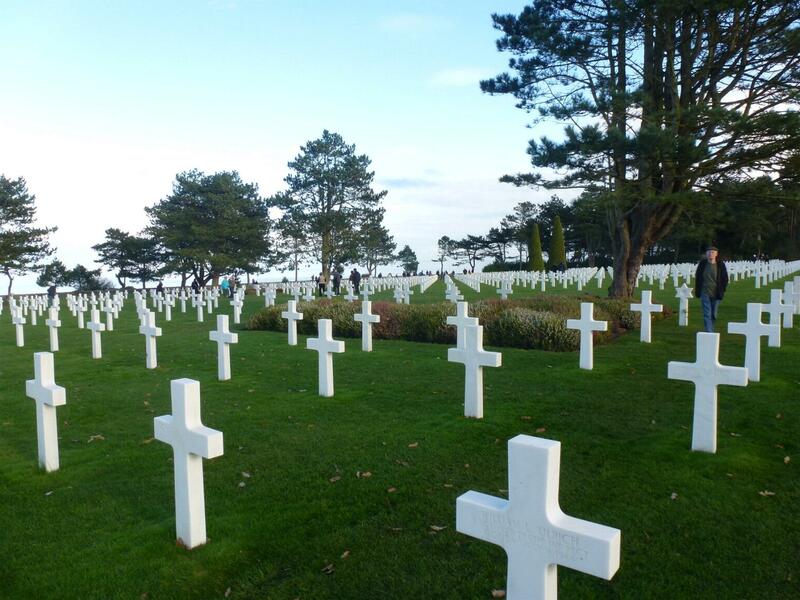 Moving along the coast we arrived at Omaha Beach and the American cemetery, nothing really prepares you for the sight of over 9000 graves set high above the beach with a clear view over the sea. That old chestnut of things going wrong in threes was on our minds all weekend. Luckily the third thing happened and wasn’t too much of an impact – the barrier on the aire broke so no one could come or go. As we wanted to stay it suited us fine, the police arrived 2 days later and fixed it, they even gave us a water token for free, result :). When we thanked them they responded ‘da iawn’, Welsh speaking French gendarmes?? 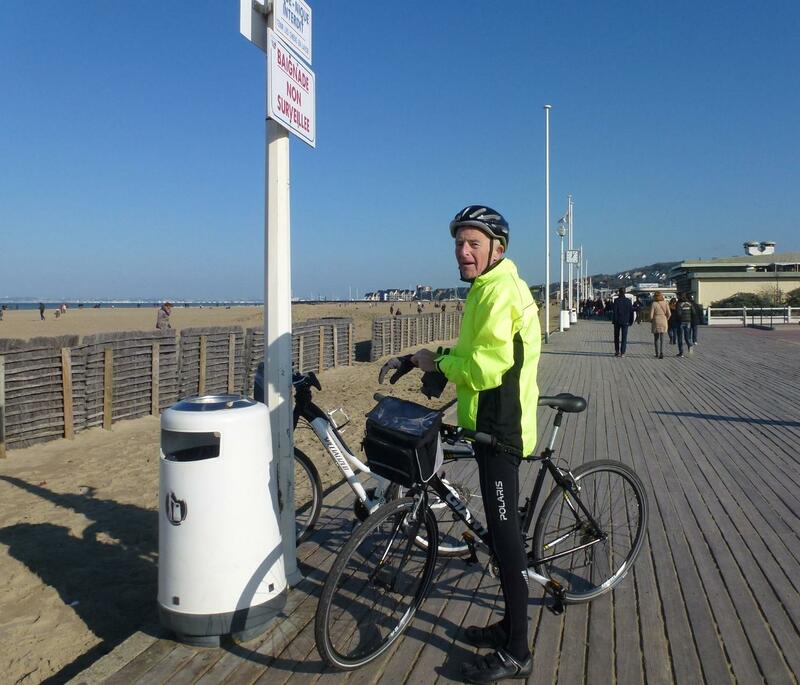 The weather has been pretty glorious for the time of year so we have made the most of cycling and walking. We found a cycle path that took us into the countryside then back along the coast so had an enjoyable 12 miles pootle along that on Monday. Considering the public holiday is Tuesday we were amazed at the amount of people around on Monday. The beaches were really busy, yes everyone had coats and hats on but there were hundreds of people either just walking along the promenades or nearly as many actually on the beaches playing games, flying kites or just walking. It seems such a different culture to Britain, much more family orientated and people seemingly wanting to get out and enjoy the sunshine even if it is a bit chilly. 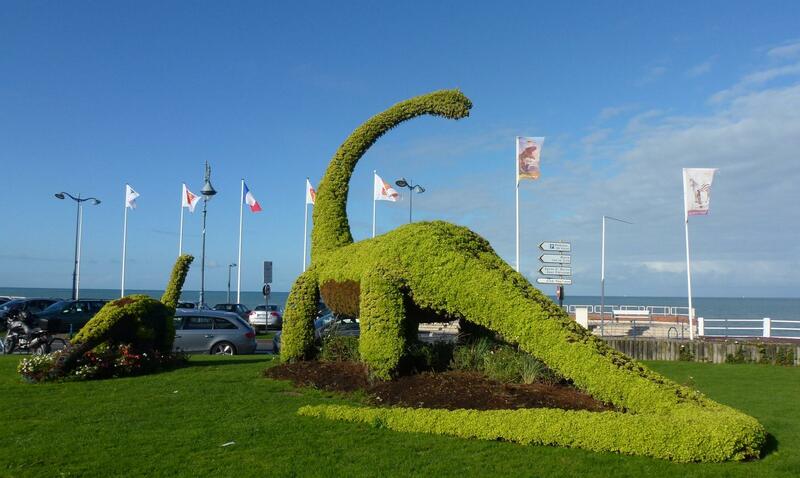 The dinosaurs at Viller Sur Mer appears to be having their annual clip this week, right outside the tourist office the topiary adult is joined some years by a baby, we were lucky to get a photo in just before the municipal workers made a start on the annual chop down. The town is much quieter now as most people seem to have gone after the extended Armistice Bank Holiday. There are still lots of cafes open but most of the shops are closed now and there are just a few people milling around the streets. On the motor-home front we are very surprised at just how many there are out and about on this coast. Everywhere we go we see several parked up on aires or at camperstops. 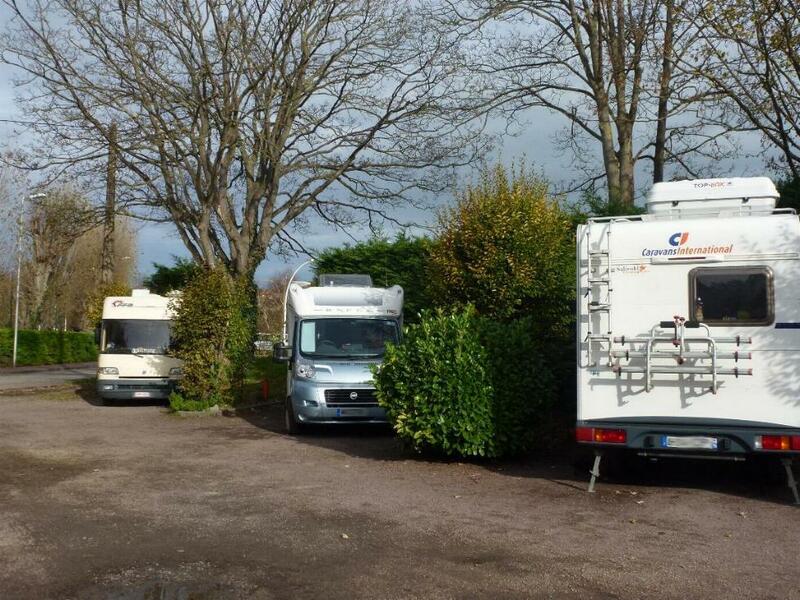 The vast majority are French but we have seen one or two Brits, it seems this is a popular place to motor-home this late in the year and to be fair its easy to see why as there are plenty of dedicated parking places everywhere you go at museums, parks, shopping areas etc. 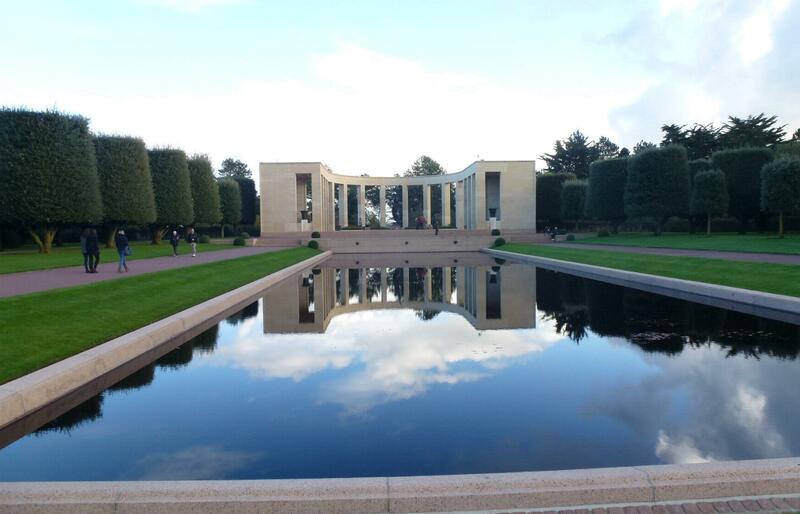 Already we are saying ‘this is somewhere we want to come back to’, we thought of Normandy very much as a transit, its worth so much more in terms of spending some time here. Today there was not a cloud in the sky so we headed out in the direction on Caen and then up to the Normandy Landing beaches. To be honest Sword beach just seemed to be a beach, there are some very pretty little villages all along but nothing to give any indication of the landings. 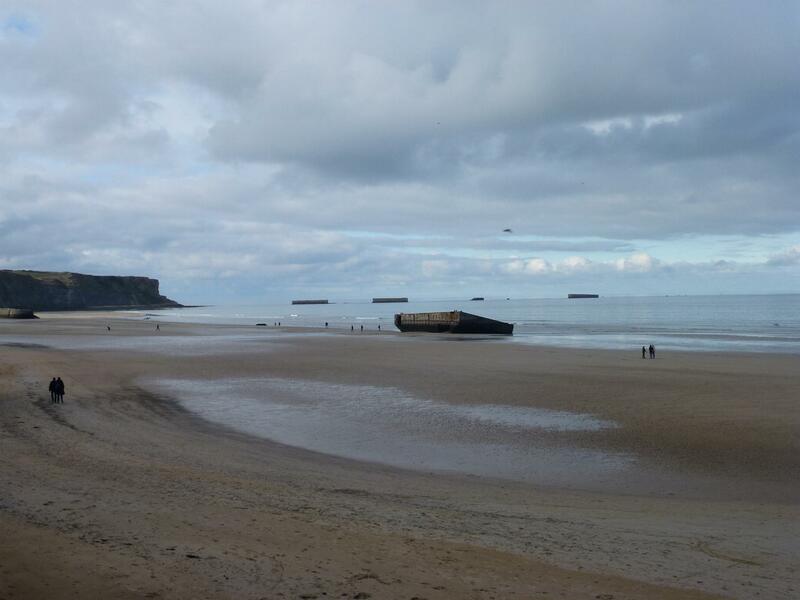 We moved further along to Juno Beach and it was a total contrast. 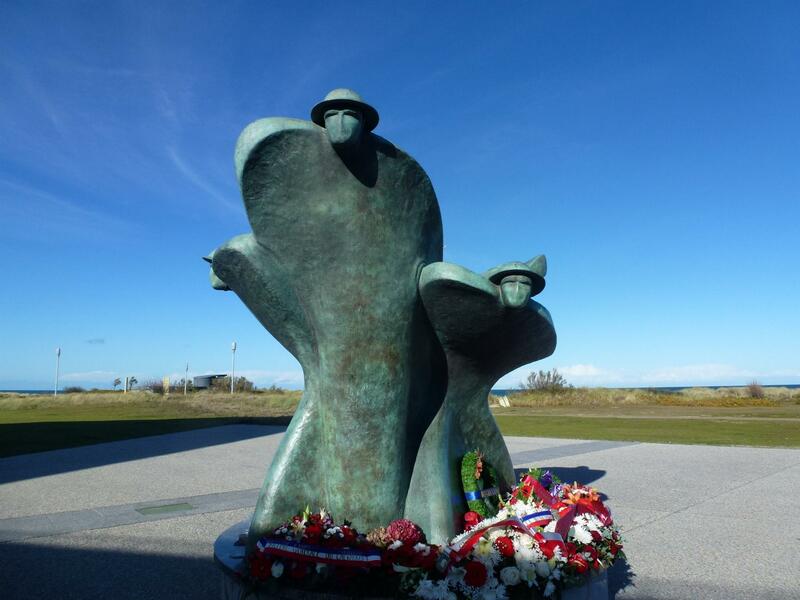 Although there is a holiday complex along the sea front there is also the Juno Beach Centre which has a Canadian museum, access to bunkers, a memorial area and several access points down to the beach itself. Very moving place to be, whilst the world goes on and there were wind-surfers and walkers on the beach there were also a few ‘old soldiers’ visiting, hard to imagine over 21,000 solders landing here but I guess the old soldiers could do so easily. 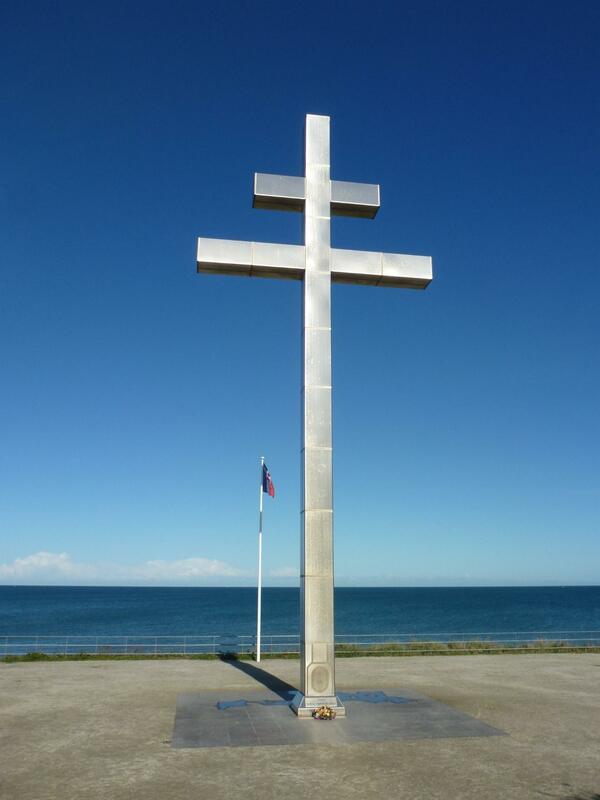 Just west of the centre is the Cross of Lorraine which marks the spot where Charle De Gaulle came ashore on 14th June 1944, yet another very poignant place where the 18 metre high cross shines like a beacon across the sand dunes. 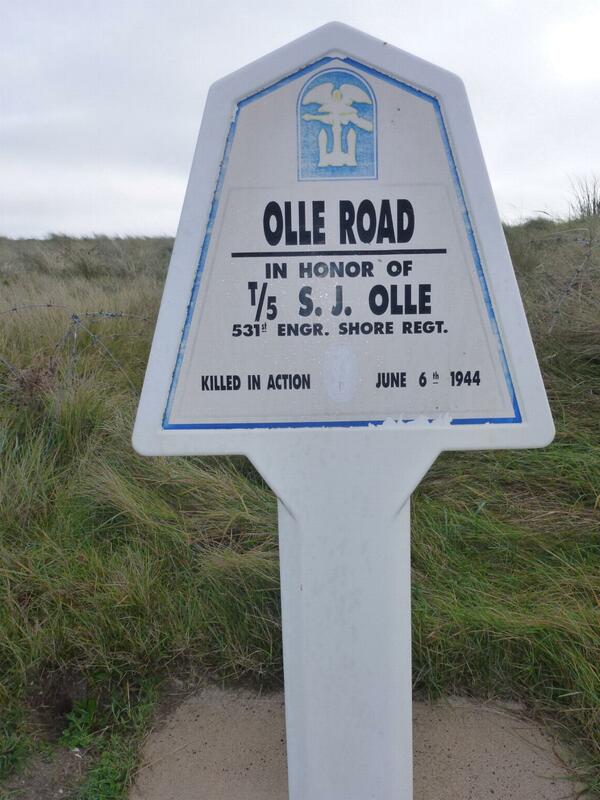 We still want to visit Utah Beach before we leave the coast so plan to do that at the weekend.